Smartphones, if you have one, could you ever go back to a time where you didn’t have it? I think for many smartphone users, that answer would be a resounding no (aside from the cost associated with owning one). The reality is, these devices pack a lot of functionality and value in our lives that I suspect many people would be lost (if you use yours as a GPS, then I mean that literally) without them. With their growing popularity, adoption, and list of features, the line between the smartphone and the other phenomenon…the tablet, is becoming increasingly blurred. The Samsung Note II is a perfect example of this, with its enormous screen and built-in stylus. Smartphone makers continue to cram more features into their smartphones, in effort to one-up the competition, and consumers continue to demand more. With that said, I can only see this trend continuing, as there are already full size tablets with built-in phone capabilities. So where does this leave us mere mortals that want it all but lack the physical attributes that make holding a 5”+ device to your ear to call a friend? 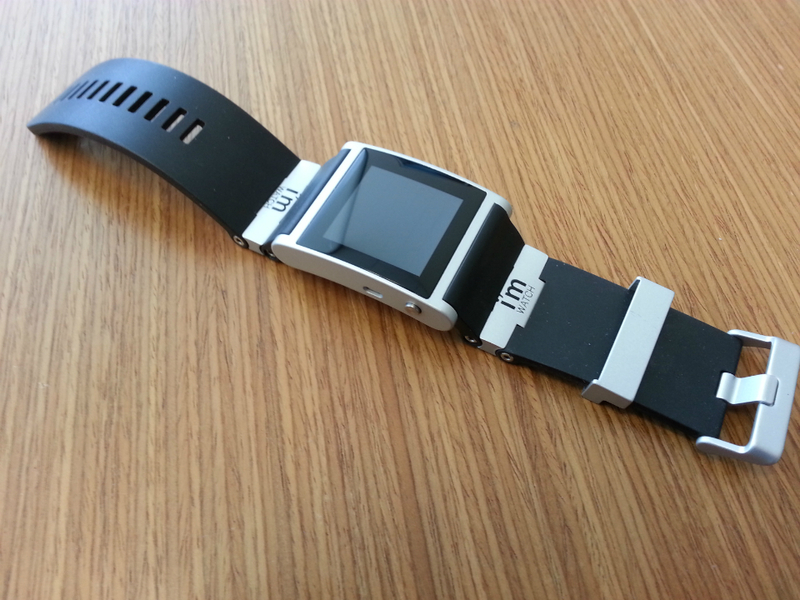 I think the emergence of the smartwatch could potentially be that answer. The smartwatch is still a relatively new concept, and I only say that because their availability, functionality, and technology aren’t quite there yet for them to appear on the “must have” list of many consumers. However, we are seeing more and more companies throw their hat into the smartwatch ring (Apple, Microsoft, etc…), and this “could” lead to yet another phenomenon. So, when we got word that we had a smartwatch coming in for review, I was pretty excited to get my hands on it and see what it could do. 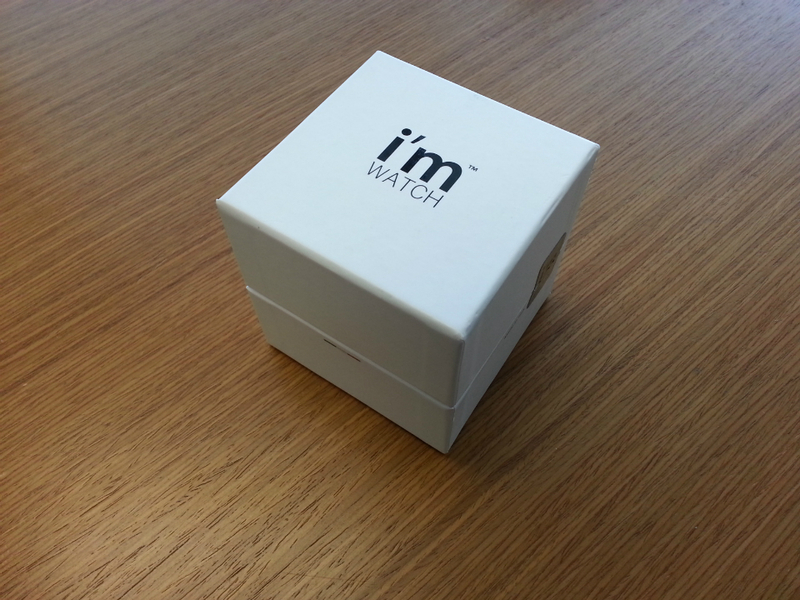 Today we will be taking a look at the i’m Watch by an Italian based company called i’m SpA. 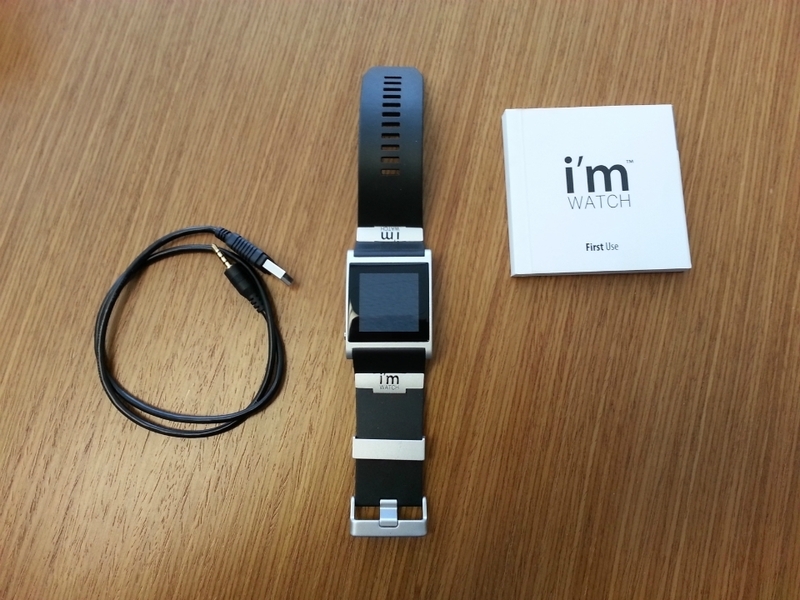 Before we get into the review, let’s take a look at the technical specs for the i’m Watch. Time for generic use: up to 5 hours. Not all phone models allow Bluetooth™ tethering. Not all versions of the same operating system allow Bluetooth™ tethering. Not all phone versions allow Bluetooth™ tethering. Not all mobile network operators allow Bluetooth™ tethering. The materials change depending on the collections: i’m Watch Color Collection, i’m Watch Tech Collection, i’m Watch Jewel Collection. Aluminum, Titanium, Silver and Gold. 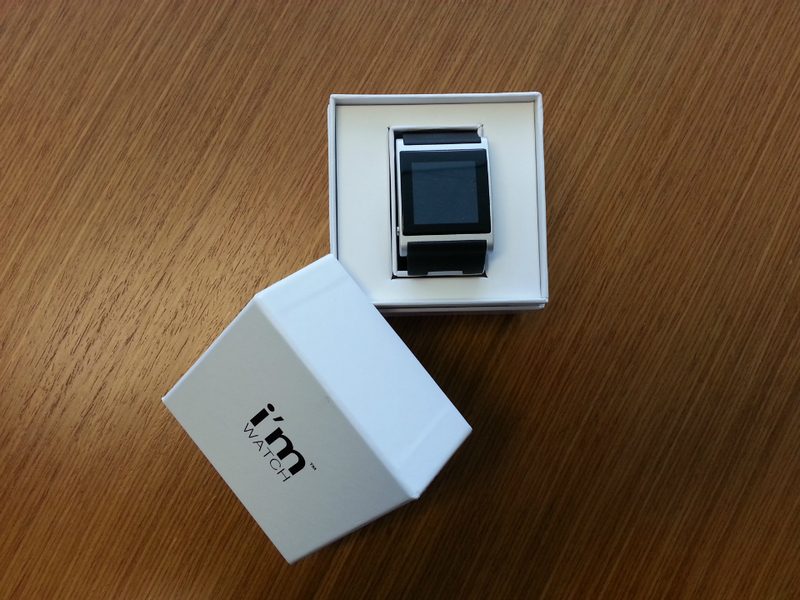 The particular model of the i’m Watch we got in for review is aluminum on black design. 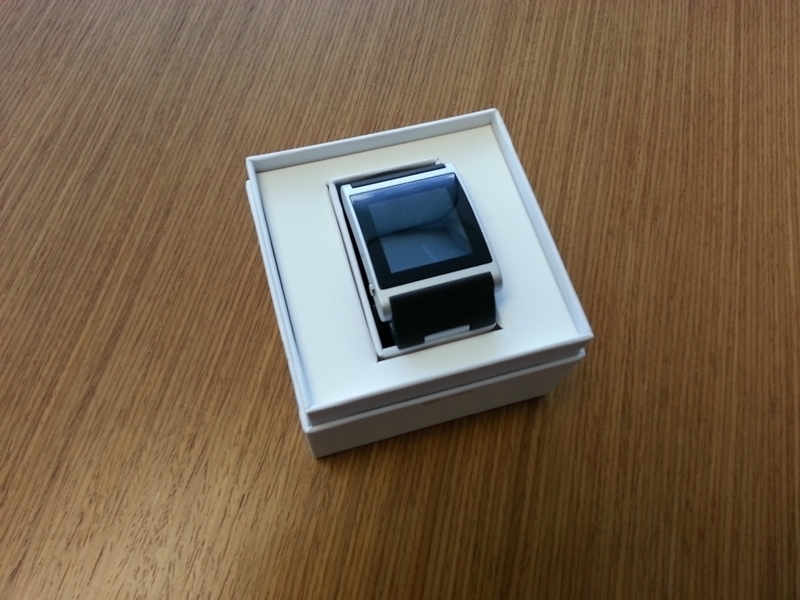 With it out of the packaging, my first thought is, “that’s a big damn watch”. The weight of the watch is deceptive and does not correlate to the i’m Watch’s size, in other words…it’s surprisingly light. 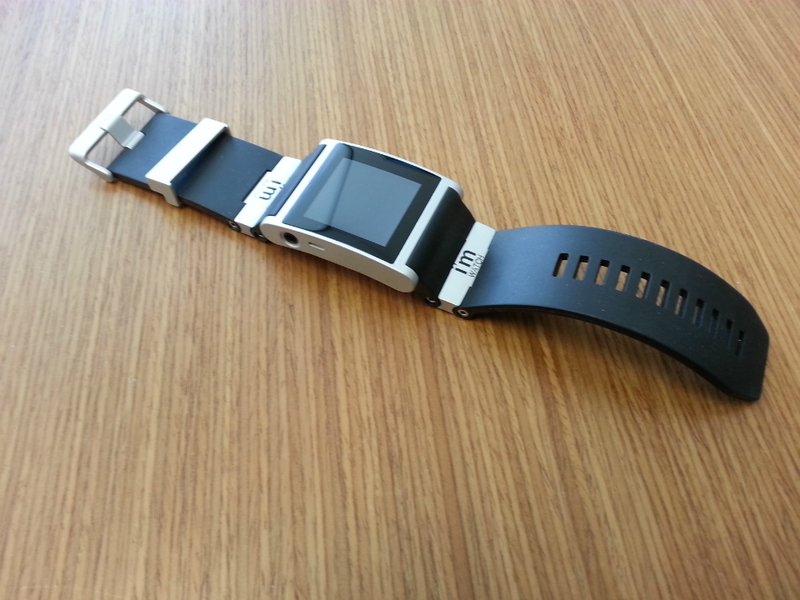 When I wore a watch, I preferred them in a thin low-profile design, and the i’m Watch is essentially the polar opposite. Ignoring my own preference, the i’m Watch has a nice anodized aluminum finish coupled with a flexible black rubber band that includes two i’m Watch branded aluminum articulating sections. At first glance, the articulating sections appear cosmetic, but draping the watch over my wrist I can see where these may also serve a fit function, depending on the wearer’s wrist size. 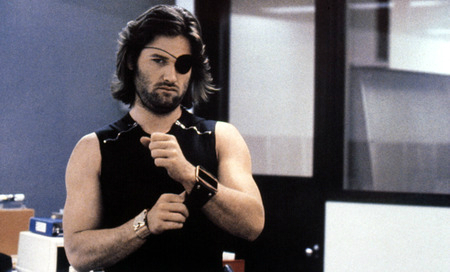 While test fitting the i’m Watch, I couldn’t help but feel like I was Snake Plissken from “Escape from New York”. On each side of the i’m Watch are tiny speaker grills, as there is an integrated speaker. There is a 3.5mm audio/power jack on the left side, and a single control button on the right. Aside from that, all interaction with the i’m Watch will occur via the 1.54” color touchscreen display. I would try to contact the company first, and failing a reply I would try to get your money back from your credit card which should be easy to do if you havent received the product. After that leave negative feedback on the BBB.